LeBOOM! Gonch FTP and the Flower's in bloom! From the drop of the puck you just knew the Penguins were going to win this game. Mellon Arena was thumpin', the towels were-a-wavin,' and you and I were on the edge of our couches. Our confidence quickly increase after Staal and his cohorts completely dominated the ice for the first two minutes. Though despite having control of the puck most of the period and being extremely physical, the period began to end with no sight of a goal on either side; the goalies were H.O.T. That was until Letang fired a laser from the point to beat Halak shortside to put the Pens up by one. Great shifts from just about everyone in the first, particularly the 3rd and 4th liners. Rupp looked like he switched jersey's with Geno the way he moved. It's so important to have your role players step up when the stars are struggling. Montreal wasn't without their chances. They had a few good looks in the slot coming from some dishes behind the net; something the Habs do very well and something the Penguins unfortunately defend very poorly. And while I know I sound like I'm repeating myself from game 3, but if not for Fleury the game could have easily been 2-1 at the end of 1. Period two started off in the same fashion. Pens controlled much of the puck possession war and had some great chances. Geno was completely out of his mind on several plays. The way he held on to the puck made me think of how I control him in NH10. Circling the wagon with the puck until I can knock off a heavy wrister. Unfortunately he was held off the scoresheet the whole game. Nevertheless his contribution and impact hasn't gone unnoticed. Quality scoring chances were held in check by the notable play from Halak. I think it was @jtkola who said Halak stops everything he sees. Well, he was right. The only two he didn't see were the ones from the point. Just as I said prior to the game needs to happen. Traffic in front of the net is key. Billy G is his name. Alexi Ponikarovski - this years Petr Sykora? Sid once again left his cape at home and decided to dress as Clark Kent tonight appearing to have lost his super powers. He was practically non-existent and simply didn't have much to offer the Pens in their win tonight. Not only were his numbers low, but he even failed to bury an empty net as the final seconds ticked away. Something's not right, we just don't know what. Though credit Gill and Georges for their defense. Man-to-man isn't a popular strategy in hockey, but it works on Sid. 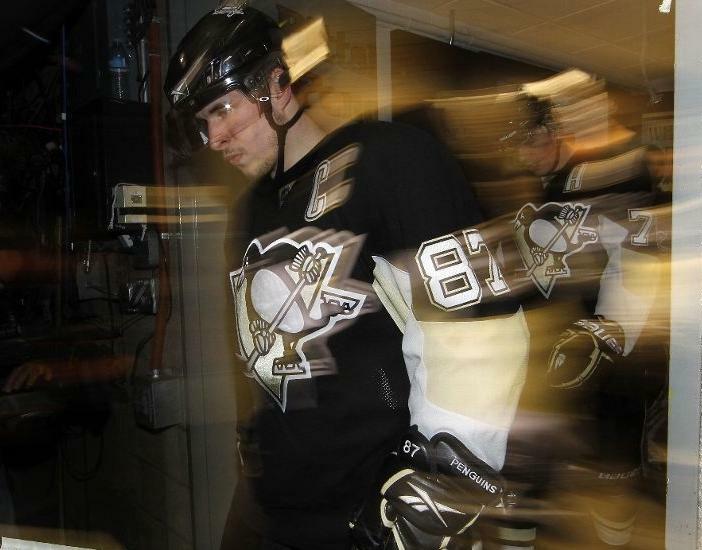 Then again, as long as the Pens win it doesn't ultimately matter how Sid plays. Betcha he feels the same way. Mark Letestu (aka Lester) made an even bigger name for himself with perhaps his best NHL game. From winning scrums along the boards, to providing much needed energy off the bench, to getting an assist on the Gonchar game winner...he was a beast. He was even real close to burying a shot from point blank, but Halak had other plans. Had he scored he'd likely have had his name in one of the star columns. 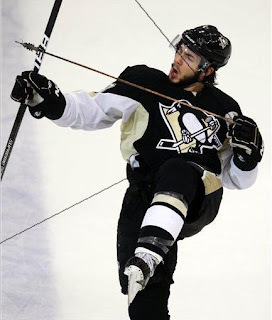 In the end it was just the tenaciousness and willingness of the Pens to hang on. Cammalleri poked the puck in the net past Fleury with just over 30 seconds left in the game to scare the hell out of all Pens fans for about 3 minutes. But the Pens held their post (unlike lasts) and took a 3-2 series lead. Monday the boys head to Montreal to try to clinch a ECF trip. Its going to be a real tough game. No word on whether Hal Gill will play. He sustained a "lower body" injury late in the game. I can tell you this, the Habs faced three "elimination" games last series and they know what it takes to win big games like this. The Pens must be ready. They must be focused. They need to come for the full 60. SUP87MAN cannot dilly-dally, he needs to give it his all out there against his Dad's former team. He needs to come strong. Maybe a few nights in the room with Craig Adams will do him some good.